Hayek talked with VW about launching the Smart, but partnered with Mercedes. 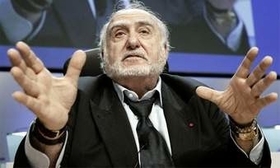 Nicolas Hayek, the Swiss-Lebanese engineer and industrialist who brought the world the Smart car, has died at the age of 82. Hayek saved the Swiss watch industry from lower-priced Asian competition in the early 1980s by offering colorful, inexpensive timepieces that he backed with equally colorful marketing. The founder of the watch company Swatch wanted to do the same thing with the automobile. The first Smart cars were to have removable body films that would allow owners to change the colors of their cars as easily as his other customers changed wristwatches. Hayak also wanted Smart to have a diesel-electric drivetrain to maximize fuel efficiency. The original specification for the Smart was to be "big enough to hold two people and a case of beer," he told AutoWeek, a sister publication of Automotive News Europe during an interview in his Geneva office years before the Smart ForTwo went into production. At the time he was planning a collaboration between his engineering firm SMH and Volkswagen AG. A tie up with VW fell through and Hayak struck a deal with Mercedes-Benz. Hayek eventually dropped out of that partnership, too, when Mercedes did not pursue his hybrid-drivetrain concept for Smart. Hayek said he needed to collaborate with a large carmaker to succeed. But in those collaborations he lost control of his original vision for the car. The result was a series of compromises necessary for safety, emissions and corporate ideas about marketability. Mercedes launched the Smart in Europe in 1998 and in the U.S. 10 years later. Hayek died on June 28 of heart failure at his office in Switzerland. The Smart lives on, along with millions of Swatches, as legacies to Hayek's creativity and fearlessness in industries so often diluted by blandness.